I've been pretty quiet here for a fair old time. Not had much to say because I've been busy on other things. This is not a typical completed project with plenty of photographs to show processes, but it is news about a project of mine nearing completion. Over nearly a decade I created a manuscript on timber technology which has now found a publisher. Release is scheduled for early 2018 - no set date yet, but I don't expect release will be much later than perhaps March, maybe even earlier if all goes well. The publisher, Lost Art Press, asked me to put together some blog posts in advance of the book's release, which can be found here. Blogging isn't really my thing, but I guess I'm a reasonably natural windbag, so the words kind of rolled off the tongue (keyboard?) fairly easily, ha, ha. I do remember posting three or four years ago asking what interest users here might have in such a book, so I guess this counts as a follow up to that. Slainte. 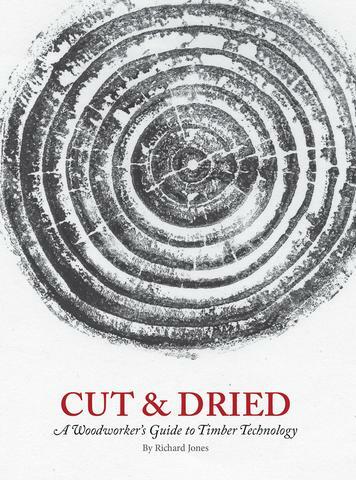 My book, Cut & Dried: A Woodworker's Guide to Timber Technology has at long last been released, and for anyone here in the UK who might be interested in getting a copy, Classic Hand Tools is the UK retailer. Outwith the UK the best source of information about availability is the publisher Lost Art Press in their About US section in which they list their worldwide sellers. Here's a link to an excerpt from it, including the Table of Contents. This book project been a long time in the making one way or another. I started writing it in 2005, not realising at first it would become a book: the initial intention was to create some articles, possibly for publication in woodworking magazines or something similar. At the time I was still writing magazine articles, although by then I was becoming disillusioned with that process and the distinctly poor remuneration for what was frequently a lot of work. The other side of researching and writing these 'articles' was as a source of knowledge to turn into learning material for the furniture students I taught. I'm not sure exactly how it came about, but I'd suddenly got too much material for a series of 2,000 or 3,000 word articles, and I simply decided to add to what I'd already got and write a book. Stupid really in a way because most books of this type are commissioned by a publisher through various processes too tedious to describe here, and then the author writes it. I did it the wrong way round - wrote the book, then looked for a publisher, but somehow it seems to have worked out! Slainte. Congratulations on getting a book published! It looks like a huge amount of effort has gone into it from looking at the excerpt. davidpidge wrote: Congratulations on getting a book published! It looks like a huge amount of effort has gone into it from looking at the excerpt. Thanks for the congratulations. You're correct to assume there was a lot of work went into it. I just hope many woodworkers, whether experienced, just beginning, professional or amateur find the information in it helpful and useful. Again, thanks. Slainte. I've only just got my copy but the little I've read to date has me wanting more spare time to read the rest. thatsnotafestool wrote: I've only just got my copy but the little I've read to date has me wanting more spare time to read the rest. Excellent. Many thanks for that positive comment. I hope you find much more of interest as and when you have time to read. I do however think it's one of those books that most are likely to dip into sections as they seek specific information. Having said that I suspect many might start by reading through the first section from beginning to end because the information there is, on the whole, more generalised and less technical. I've always seen that section as a gentle introduction to a range of relevant topics associated with trees, such as their history, socio-political issues, and so on. Anyway, I hope you enjoy what you find (when you have time, of course!). Slainte. What! You have a copy from which the printer excluded Chapter 14? You'd better get on to the publisher about that, ha, ha. Slainte.